Recently I had the opportunity to visit Boston Children’s Hospital. As representatives of Mass Drug Card (www.madrugcard.com) my colleague Elise Donovan and I were given a tour of BCH – the recently named #1 pediatric hospital in the United States for 2017/2018. 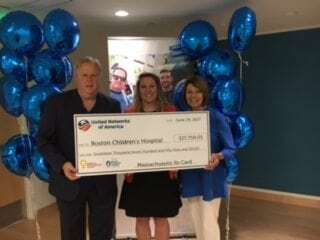 We met with Katie Beltz, of BCH, the Children’s Miracle Network Coordinator for the hospital, and Charles Savicki, Director of Corporate Initiatives for the Hospital Trust. During the tour we learned that BCH treats over 600,000 patients a year! Truly amazing work is performed here! We also learned of the great history and innovative developments since Boston Children’s opened a 20 bed facility in 1869 in Boston’s South End. In 1938 Dr. Robert Gross performed the world’s first successful surgical procedure to correct a congenital cardiovascular defect. This was done under tremendous opposition from his own hospital due to the risk involved. The person’s life he saved that day is 75 years old today and works as a volunteer at Boston Children’s Hospital. Another great doctor was Dr. Sidney Farber, who in 1947 achieved the first successful remission of acute leukemia. He later went on to co-found the world renowned Dana Faber Cancer Institute in Boston. Up to the present day, there have been numerous medical discoveries that have saved countless lives. As a life-long Bostonian, I have grown up hearing about this fine institution and the miracles they have worked, helping so many people through these dreaded illnesses. What truly stood out the most was the caring and thoughtfulness that goes into dealing with the young children, who upon entering the hospital are naturally overwhelmed with their circumstances. Through a huge interactive screen located in the lobby, the children are quickly put at ease. Also there are play rooms that afford them the time to be just what they are – young kids – and to forget about their worries for a moment. 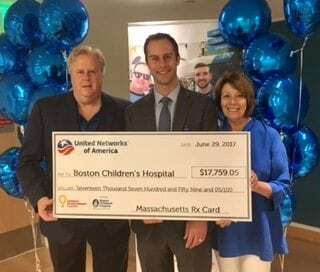 Through our work with the Mass Drug Card (toll free 888-737-7784) and our area pharmacies we are able to donate to Boston Children’s Hospital and the Children’s Miracle Network of hospitals throughout the country. After visiting BCH, I saw first hand that our donations are well spent and I’m honored to be a contributor to amazing organizations as Boston Children’s Hospital, and the Children’s Miracle Network. Elise and I encourage all representatives of individual State Drug Cards to visit, work with and tour these fine facilities, if given the opportunity.